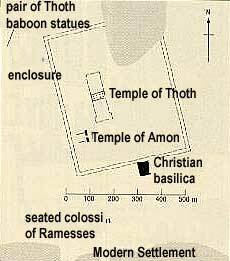 Located in Middle Egypt, Hermopolis (Magna) was a major cult center of Thoth. Thoth was called by the Greeks, "Hermes". It is from this name for Thoth that we derive the name of the city, which means literally, "the city of Hermes". Hermopolis was the ancient capital of the 15th Upper Egyptian nome. During the Islamic period it was heavily plundered. Despite that there are still traces of temples dating from the Middle and New Kingdoms. Rameses II built a temple there with materials derived from the abandoned city of Akhetaten. The Hermopolitans claimed that their theory of creation was older than any other in Egypt. They believed in a system of eight deities, four gods and their respective consorts. The two that became the most prominent in later times were Nun and Amon. Nun was respected in many parts of Egypt as the primordial waters from which everything emerged during creation. Amon, of Theban fame, rose to prominence during the reign of the princes of Memphis. The carving pictured above shows the Ogdoad and Thoth depicted as geese. It has been noted by many that the goddesses of Hermopolis simply had the female equivalent of their partner's name (for comparison's sake, "Jane" is the female equivalent of the name "John"). Therefore, each pair of deities can be viewed as the male and female parts of a whole and perhaps greater god. In any case, each of the four gods were the gods of one of the creative powers or sources. Nun, water; Heh: unendingness, eternity; Kuk, darkness; Amon: that which is unseen or air. 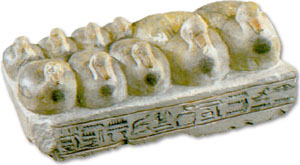 The four gods were depicted with frog heads, while the goddesses were shown with the heads of serpents. At some point these entities which comprised the primordial substance interacted explosively and snapped whatever balanced tensions had contained their elemental powers. This burst of energy thrust up the primeval mound located at Hermopolis where the sun was born. Following creation, the Ogdoad ruled the earth during a Golden Age. They then died and went to live in the Duat, or Underworld. The Ogdoad were responsible for the flow of the Nile and the rising of the sun each day. It was said that everyday they brought forth the lotus that held the sun-god. In Hermopolis, four differing stories of the Creation were known. The first stated that the world began in a cosmic egg which was laid by a celestial goose on the primeval mound. The egg contained the bird of light, Re who then created the world. Pilgrims to Hermopolis were often shown the remains of this great egg. Another version says that the egg was laid by an ibis, the bird of Thoth. As the cult of Thoth was newer than that of the Ogdoad, it is likely that this version was created by the priests of Thoth to merge the mythologies of the Eight and of Thoth. The Ogdoad was sometimes called the souls of Thoth. The third creation story says that a lotus flower emerged from the waters of a lake called "the Sea of the Two knives". This lake was located in a park near the temple in Hermopolis. When the lotus' petals opened, a divine child was revealed - Re. The final story is the same as the previous with the exception that inside the lotus was a scarab beetle, which is a symbol of the rising sun. The scarab then transformed into a crying boy. His tears became mankind. The lotus was sometimes identified as the Eye of Re.